You need to use fabric tension display when decorating your exhibition stand at an expo hall, trade show or shopping centre. Fabric tension displays are not just eye candies that will make your stand look pretty. They are also powerful tools for telling your audience what your products and services are all about and getting them curious enough to learn more. 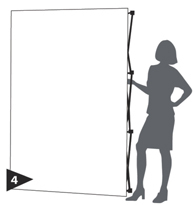 You can use our 3×2 straight pop-up fabric wall effectively for this purpose. 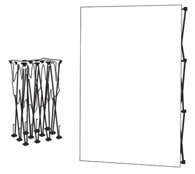 Our 3×2 straight pop-up fabric display is made to draw the crowd’s attention. This fabric wall is a set made up of a straight, silver-finished frame and a full-colour fabric graphic. The frame measures 1524mm/W x 330mm/D x 2260mm/H and stands three cubes high, two cubes wide. The fabric graphic that comes with the set sticks to the frame with the help of Velcro strips. Once attached, the fabric graphic stays securely in place. You can order it single-sided, but for better exposure, it is recommended that you get the double-sided displays. 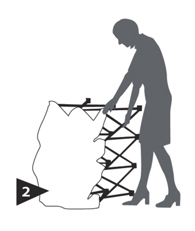 The 3×2 pop up fabric wall set is packed in its very own carry bag. 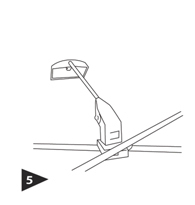 Add-ons include halogen lights that you can use as spotlights for your display. For maximum impact, you can combine this fabric tension display with other banner displays at your booth. This media wall is a money-saving solution for your display needs. It is entirely reusable. If you need new displays in the future, you only need to order new fabric graphics to replace the old ones, and then attach your new graphics to the frame. Another big advantage you will enjoy with our 3×2 straight pop-up fabric banner wall is it is easy to install, leaving you with more time to deal with other tasks. 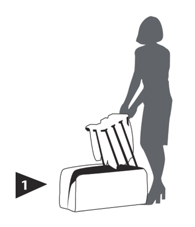 Just take the frame out of the carry bag and stretch it to make it expand to its full size. 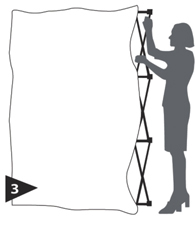 To keep the frame stable, fasten the hooks behind it together and then let out its feet. The last step is to attach the fabric graphic on the frame via its Velcro strips. The entire process takes less than five minutes to complete. Our 3×2 straight pop-up fabric wall is the solution you’re looking for if you need a fabric tension display for your exhibition stand. Call us now to learn more about our media walls.